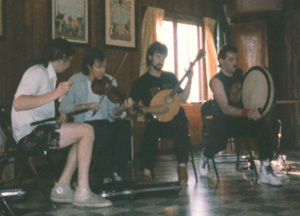 "The Erinoids - Providence-based traditional Irish band who were instrumental in creating a new awareness of traditional Irish dance music during the early '80's in the Rhode Island area through their work with the R.I. Ceilidh Club and with the help of Maureen Doyle, dance instructor." 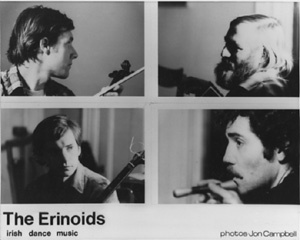 The Erinoids embark to Chicago in 1985. "Mance Grady, Bodhrán - One of the finest players of the Irish drum in America. 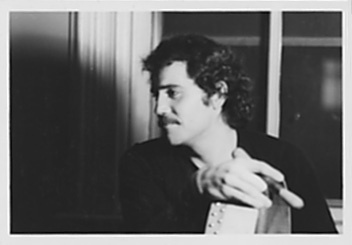 Dissatisfied with the quality of the instruments he found, Mance taught himself the technique with an eye to making a sturdier, more versatile-sounding drum. His bodhráns are in great demand, and he performs regularly with the Erinoids and the Providence Ceili Band." Crankin out the tunes for dancers at the Providence Ceilidh Club. 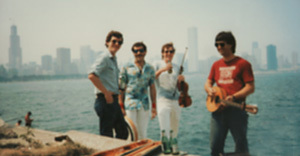 (from Left) Mark Roberts, Jimmy Devine, Bob Drouin, and Mance. 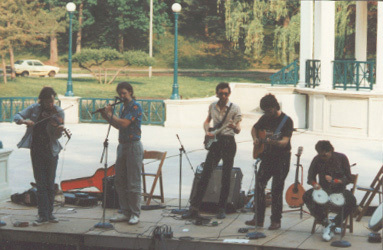 noted blues guitarist, groovemaster Paul Murphy (center). (from Left) Jimmy, Mark, Paul, Bob, & Mance.